Now that all of the holiday decorations are down things can seem a little bare. Why not add a little sparkle to your home with these snowflake lanterns. They are easy, inexpensive, can be made quickly and can be used indoors and out. You can use the same technique on mugs, wineglasses or anything glass. You can start with any glass container. I used pickle jars for my larger lanterns and a garlic jar for the smaller one. A white DecoArt glass paint marker makes quick work of painting snowflakes. Tape pattern to inside of jar and trace with paint marker on outside of jar. Follow manufacturers directions for using, curing paint and washing glass after completed. For a little extra bling you can add rhinestones to your lanterns using a multipurpose glue such as E-6000. (note: if using rhinestones on drinking glasses you will want to hand wash them). Complete by tying a pretty ribbon around the rim of the jar. If using as luminaries outside place a little sand in the bottom and then add your votive. My cousin just had a party and used these lanterns to decorate both inside and out of her home. It made the celebration even more festive. 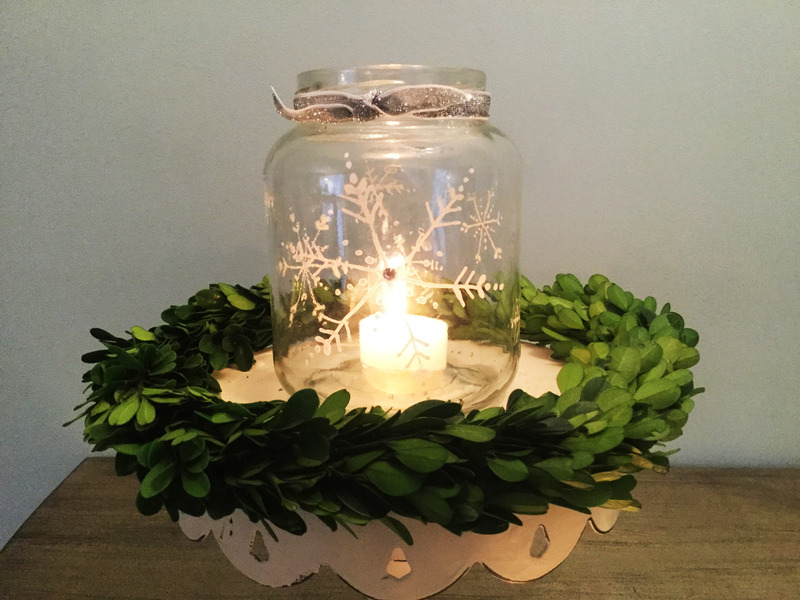 Hope you will enjoy creating these wintery lanterns. Use your imagination and create other fun projects. PS. If you don’t think you can eat enough pickles for the number of lanterns you would like to create, consider buying a case of pickles and taking them to a local mission. Let them open the jars and keep the pickles for eating and you can bring the jars home for creating – a double blessing. Jane these are so pretty!!! Thanks for sharing this great idea!!! Thank you Robin, they were fun and easy. Thank you. Bobbi, they were fun to do. We are going to miss having you in the neighborhood. Wish you the best with your new adventure. Thank you Amy, they are so simple but add a lot of sparkle. Beautiful Jane! I love them…….I’m going to give them a try ——> in my spare time! And of course I will need to make MORE glitter houses to go with! Thank you Lynn, I know what you mean, but I always feel better when I am busy 🙂 I am gearing up to do some spring glitter houses. These are so pretty, Jane! Thank you for sharing…the article was wonderful! Thank you Linda, they added a lot of sparkle to my cousins party.